MINNEAPOLIS, MN--(Marketwire - April 30, 2008) - Advanced Circulatory Systems, Inc. announced today that its ResQPOD® technology has been inducted into NASA's Space Foundation Technology Hall of Fame. The award recognizes the technology developed with NASA in their Kennedy Space Center research laboratory to treat orthostatic intolerance -- or the body's inability to adjust to an upright position, causing potential symptoms of nausea, rapid heart rate, fainting and low blood pressure. Astronauts experience orthostatic intolerance as they re-enter earth's gravity field from space and experience blood pooling in the lower half of the body. ResQPOD is a simple, non-invasive device that quickly and effectively increases circulation and blood flow to the brain. The technology is now being applied by Advanced Circulatory Systems to medical challenges beyond the space program, including its use in the treatment of low blood pressure, orthostatic intolerance and cardiac arrest. 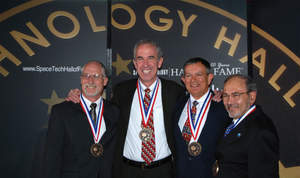 The prestigious Technology Hall of Fame status is granted to technologies that are co-developed by private industry and NASA that have a significant positive impact outside of the space program. Many technologies co-developed for the space program have gone on to become embedded in our culture. A few of them include the software system for precision Global Precision Positioning System (GPS), the Cochlear implant, Excimer Laser Angioplasty System, DeBakey blood pump, DirecTV and cordless tools. In 2008, ResQPOD was one of three technologies awarded this honor. Dr. Keith Lurie is co-inventor of the ResQPOD and Chief Medical Officer at Advanced Circulatory Systems. Dr. Lurie said, "We are grateful to the team that worked collaboratively on this important project. We worked closely with the Kennedy Space Center Biomedical Lab and also staff from the Department of Defense and the University of Texas Southwestern. We truly believe that our joint research work and its resulting products will have far-reaching impact in the medical community. The data developed in this joint project allowed us to receive FDA approval to bring our technology to the private sector." The research and data developed while working on the problem of astronaut hypotension has already led to numerous applications where low blood pressure occurs. The ResQPOD is in use at more than 1,500 hospitals and emergency management systems across the U.S. to help increase circulation in cardiac arrest patients during cardiopulmonary resuscitation. It is the only technology that is given a class IIa recommendation by the American Heart Association in its guidelines for purposes of increasing circulation and resuscitation rates. A related product, the ResQGARD™, is used to help improve blood flow and circulation in patients that are suffering from low blood pressure as a result of traumatic injuries, dehydration, dialysis and orthostatic intolerance. Both products are available through Tri-anim Health Services. Video and additional product photos are available at http://www.advancedcirculatory.com/Study.